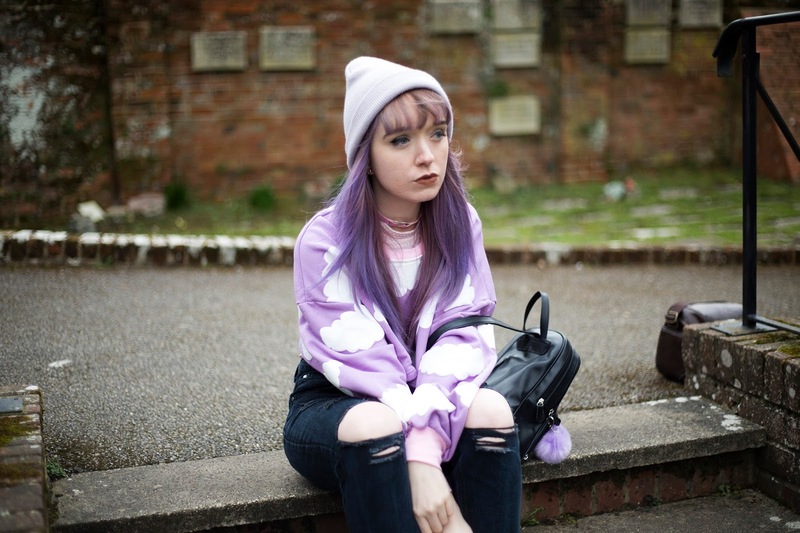 This jumper feels like I'm channeling my inner "Kawaii-self" thanks to its lilac shade and Japanese cartoon inspired cloud print. In fact a lovely friend gave me hers after receiving two by mistake in a recent OASAP order. I just love how girly it is and how the jumper injects a shade of pastel colour to my outfit, which is normally along the lines of all black/"gothic". For todays I look I wanted to add a harsh contrast to the jumper, both colour and fabric wise, with that in mind I opted for a pair of my ripped high waisted Mom Jeans from Boohoo to pair with the jumper. Keeping along the "harsh contrast" feel I also paired the jeans with a pair of my beloved Dr. Martens which I think I have managed to *finally* break in. For those of you who have ever owned a pair of DM's know exactly what I mean when I say that your feet will have to suffer for a couple of months before the pleasure of wearing them kicks in...Needless to say I've binned the plasters and embracing the DM's.